We picked the 10 best iPhone Games with great graphics (and, yes they’re Free), to the delight of your gaming experience on iPhone. So you have an iPhone or iPad? Want to play free games on your new iOS device? We are here to help you. We make the list of top 10 best iPhone games with stunning graphics. We found a lot of games with cool graphics and gameplay quality, then you know it was really difficult to choose the best one. Because all are awesome! 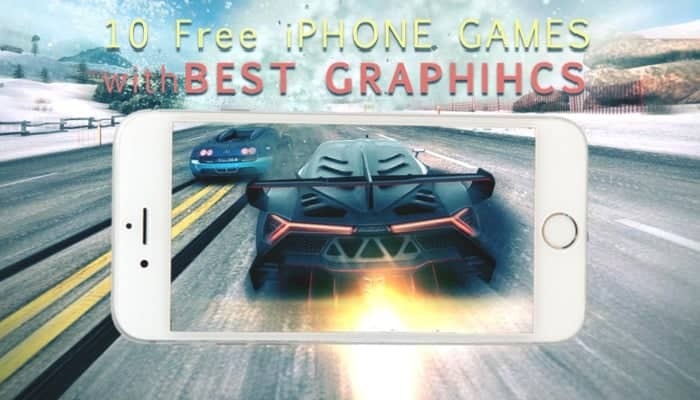 Have a look at the top 10 games for your iPhone with stunning graphics! Note: all games are free to download! Asphalt 8: Airborne is an award-winning mobile game that sets a new standard for Mobile racing games. Perform aerobatics at high speed, dynamic driving experience, powered by an awesome physics engine! The second version of the famous zombie killer game offers a high-quality graphics experience. Even if you are not a fan of shooters, it is worth a try just to admire the graphics. FIFA 15 is a beautiful game of football with breathtaking graphics. Over 10,000 players from over 500 licensed teams and more than 30 different leagues and real stadiums from around the world are now on your iPhone. Experience the best game of football with stunning graphics on your iOS devices. Beach Buggy Racing is a small racing game to the ‘Mario Kart’ but with remarkable graphics. Stunning 3D models and circuits recreated with a generous mix of animation. And your goal is to come first in the race and survive the attack of the other competitors. The game offers gameplay very well suited for touch screens, excellent graphics and the optimal duration that puts players in a spaceship, where you have to survive the zombie plague and discover the cause of this infection. It is a zombie game with stunning graphics, an exciting story, several missions and lots of guns. You will surely enjoy this free game on your iOS devices. Injustice: Gods Among Us puts heroes and villains of DC Comics in a spectacular game of action and struggle with stunning 3D graphics. The 3D graphics are sensational and have a better quality than other games in the genre. The game will provide many hours of fun for players who want to dive into an epic world of fantasy. The game has better graphics, better animations and improved combat system, thousands of objects, multiplayer online to chat in real time. To succeed, you need a good dose of reflections, lots of adrenaline and aggression to run and attack enemies at a time. Play as a fearless hero of the West where you will fall in several missions. Your mission is to bring down the bandits and even the monstrous creatures. Spectacular graphics and ability to move on various galloping horses makes it even more attractive. Real Boxing is the most realistic boxing game that you have seen on mobile platforms! The game has incredibly beautiful graphics, offering a quality like for the game console. Download the HD version of the most popular game of Birds and Pigs for free on your iPhone! The survival of the Angry Birds is now at your hand. Dish out revenge on the green pigs who stole the birds’ eggs. Use the unique destructive powers of the Angry Birds to lay waste to the pigs’ fortified castles. If you know other interesting games with stunning visuals, you can notify us in the comments. We want to enrich this list of the best iPhone games with stunning graphics with your suggestions. Thank you. Enjoyed the article? Please Share and let your friends download above the best free games!